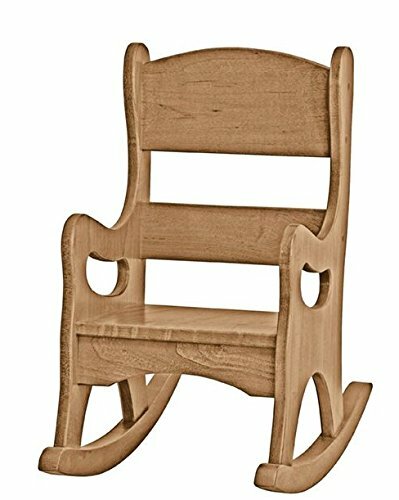 AMISH HANDMADE HEIRLOOM FURNITURE CHILDREN'S ROCKING CHAIR These beautiful Rocking Chairs for toddlers are manufactured in a primitive wood shop using old world carpentry skills. Solid Maple wood is hand cut, sanded and assembled with loving care using high quality hardwood. Safety and quality come first with every piece. Our furniture is built using durable, biodegradable wood, then finished with child-safe water based paints and stains that comply with all CPSIA standards. These heirloom quality pieces will last for generations. Measures: 25" High X 14" Deep X 13½" Wide MADE IN AMERICA Day Care Quality Pieces are made with non-toxic, eco-friendly varnishes. Special attention is paid to hand sanding edges and corners for a safe and beautiful product. Note: Stain colors may vary due to natural variations in the wood. Amish Handmade in the U.S.A. PLEASE NOTE: Each is individually handmade-to-order by Amish craftsmen guaranteeing you a unique, true one-of-a-kind piece. Please allow up to 7-10 business day manufacturing time. If you have any questions about this product by USA Handcrafted, contact us by completing and submitting the form below. If you are looking for a specif part number, please include it with your message.